A member of the “Small Luxury Hotels of the World” group, Heritage Le Telfair Golf and Wellness Resort resides on the former sugar estate of Domaine de Bel Ombre. The resort sits on one of the most pristine beaches in Mauritius, with a Heritage Nature Reserve right on its doorstep. The resort is inspired by its former resident, naturalist Charles Telfair, and exhibits an elegant, colonial style design, with spacious grounds and nature inspired decor. Rooms and suites are large, boasting floor to ceiling French windows and balconies to appreciate those breath taking ocean views. The resort is perfect for families, as it provides a wide range of restaurants serving both local and international cuisine. There are also Kids’ and Teens’ Clubs available, as well as an adjoining golf club, which boasts a scenic 18 hole course. Guests can spend their time relaxing at the infinity pool or the hotel’s private beach, which features the beautiful white sands and turquoise waters that Mauritius is known for. A range of hotel child prices apply to guests aged 2-11 and 12-17 years. "Gourmet Bliss" is now available at Heritage le Telfair and includes: Buffet breakfast at restaurant Annabella's. Lunch and dinner as per their operating schedules at selected Domaine de Bel Ombre restaurants including Le Palmier & Cavendish at Heritage Le Telfair, C Beach Club or Club House at Heritage Golf Club (excluding some dishes). Cakes and pancakes at the Cavendish Bar between 15.00 - 17.00. Local and imported drinks, beers, soft drinks and selected house wines - unlimited selected champagne by the glass in all bars and restaurants. Minibar. Room service (tray charges apply). Beach and poolside service at Heritage le Telfair. Free unlimited green fees on the 18-hole golf course (excluding equipment and lessons). Access to the Sports & Fitness Centre and Aquagym. Sailing, windsurfing, kayaks, pedal boats, snorkelling and glass bottom boat trips. 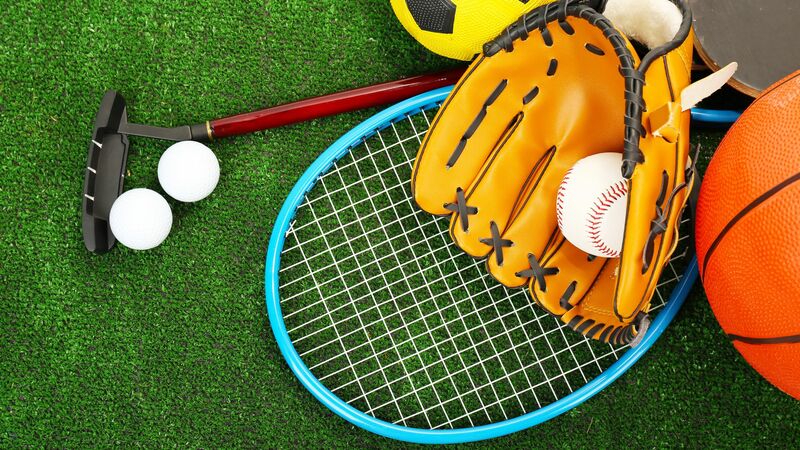 Tennis, table tennis, archery and bicycles. Free access to the Timono kid's club for children aged 2-11. Annabellas treats guests to an enormous buffet style breakfast, divided into four dining areas around an open kitchen. Come back for dinner to enjoy a themed a la carte menu. A children’s menu is also available. This relaxed beachside restaurant treats guests to delicious al fresco lunches; it’s the perfect place to unwind by the ocean. Come to beachfront C Beach Club to enjoy a bar, a boat house and ice cream while overlooking the beautiful Indian Ocean. This relaxed lounge is the perfect setting to enjoy local rum or a light snack while listening to beautiful piano music. Enjoy your meal with exquisite views over the golf club and surrounding hills at this relaxed, English style country club. Located on the beach and overlooking the lagoon, Ginja serves a delicious Pan-Asian fusion that shouldn’t be missed. The dress code is Smart Casual from 18:30 (collared shirts, trousers and closed shoes are required for men). This restaurant is adults only. 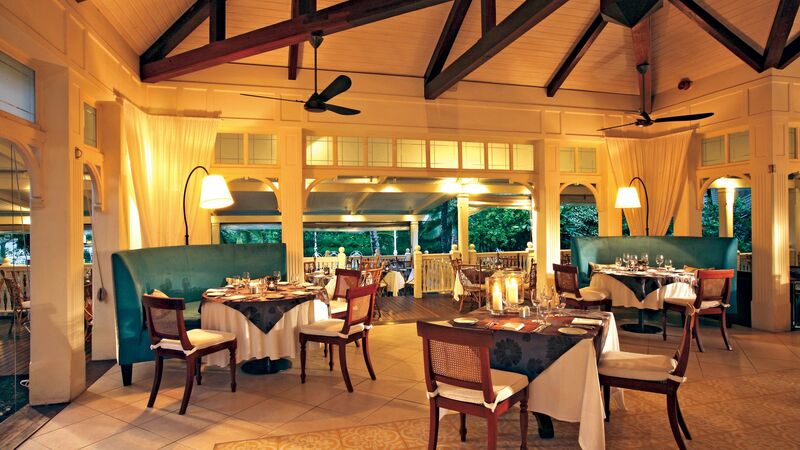 Enjoy exquisite local Mauritian cuisine inside an enchanting 19th century colonial mansion. The hotel is home to two swimming pools. Opt to enjoy the heated pool or the beautiful infinity pool. The hotel boasts its own private beach, with pristine white sands and stunning turquoise waters. Little ones can spend their days playing and trying some of the activities available in the Kids’ Club. Teens aged 12-17 can participate in the activities offered by The Teens Club. These include water sports, activities and discos. There is a free babysitting service for children aged 0-35 months. Guests looking to relax can head to the spa, where a range of deluxe treatments are on offer, in the setting of a tranquil tropical jungle. 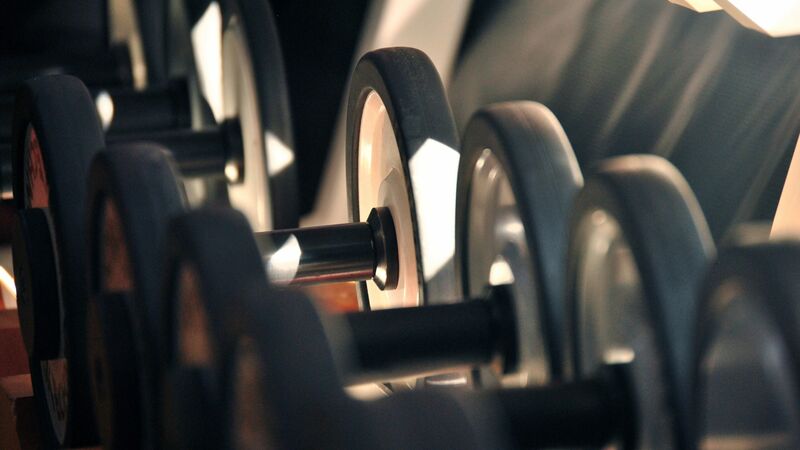 Those looking to stay active during their stay can head to the fitness centre, where a range of cardio and fitness machines are available to use. Personal trainers are also available. The hotel offers a wide range of activities, including volleyball, football, badminton and tennis. Mountain bikes are also available for those wanting to explore the surroundings. 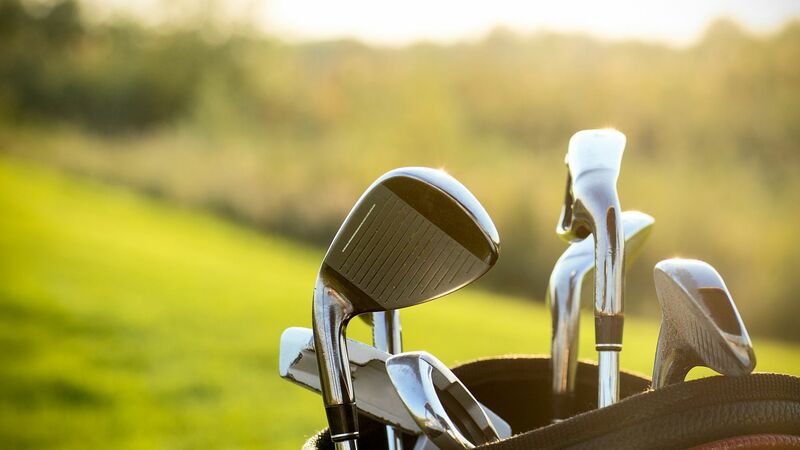 The resort boasts a 18-hole course, with equiptment for hire if required. On the course, there is a club house, restaurant and bar. There's an additional 9-hole, par 3 short course, with the possibility of playing footgolf. The Golf Academy offers lessons, as well as video analysis of your shots. In addition, the resort can offer priviledged access to three other 18-hole courses in thr region: Le Paradis, Tamarina and Avalon Golf Estate. Heritage Le Telfair Golf and Wellness Resort is privileged to reside on one of the most beautiful stretches of beach in Mauritius, complete with pristine white sands and deep turquoise waters. The resort is surrounded by a heritage nature park in the foothills of Plaine Champagne mountain, where you’ll find gorgeous waterfalls and lush forests. Choose to take a walk through one of the many nature trails or relax by the Indian Ocean to appreciate the beautiful location. Or enjoy a snorkeling or scuba diving trip and see the largest concentration of seahorses on the island, as well as colourful reefs and tropical fish. Heritage Le Telfair Golf and Wellness Resort is a 45 minute drive from Mauritius Airport. Garden View Suites offer elegant decor and open onto beautifully landscaped gardens or breath-taking views of the river banks. Sea View Suites are spacious and overlooking the turquoise lagoon. Beachfront Suites are directly on the beach offering space and comfort and fantastic views with either a king size bed or 2 twins. The bathroom has a separate bathtub and shower. Please be aware not all Beachfront Suites are located on the ground floor but offer panoramic views. Junior Suites have a four-poster bed, a free-standing bathtub in the bathroom as well as separate shower, a lounge area, an espresso machine, an iPod docking station, CD/DVD player and offer a butler service. Outdoor shower is available in the ground floor suites. Junior Suites Sea View have a four-poster bed, a free-standing bathtub in the bathroom as well as separate shower, a lounge area, an espresso machine, an iPod docking station, CD/DVD player and offer a butler service. Outdoor shower is available in the ground floor suites. The furnished balcony offers views of the ocean. Senior Suites have a four-poster bed, a lounge and dining area, an espresso machine, an iPod docking station, CD/DVD player and offer a butler service. Outdoor shower is available in the ground floor suites. Senior Suites Sea View have a four-poster bed, a lounge and dining area, an espresso machine, an iPod docking station, CD/DVD player and offer a butler service. Outdoor shower is available in the ground floor suites. The furnished balcony offers views of the ocean. Ocean Suites have a four-poster bed, a living area and a separate dining room, an espresso machine, iPod docking station, CD/DVD player and a spacious veranda and are located on the beach. Outdoor shower is available in the ground floor suites. These rooms offer a butler service. Stay between 4-6 nights and receive a 15% discount on the hotel price. Stay for 7 nights or longer and receive a 35% discount on the hotel price. The above offers are valid for holidays between 01 February - 20 December 2019 or 06 January - 31 January 2020. We have been holidaying in Mauritius for the last 30 years and probably stayed at a dozen of the 5 star hotels. Everywhere in Mauritius the service is very good. This year (2019) we stayed at Heritage Le Telfair which is now top of our number one choice, not only for service, food quality and variety but for the ???Butler??? service (from Melvin in our case) which was truly exceptional .The assistance provided by Ashni and the nurse in arranging a hospital visit for my wife was fantastic. Excellent all round. “ A great place to visit! We stayed at this resort at the end of October 2018. There is nothing that we could complain about. Great lodging, excellent food (Ginja was our favourite) and right next to the golf club which was very convenient as we played every other day. Highly recommend this place! “ Great hotel, great staff, great food! We stayed in January 2019. The staff is always ready to help you with a smile. Our room was perfect and clean. Great service and good golfing. The food was awesome. We highly recommend this hotel if you are looking for sun, sea and service! Nothing to complain. Our room was pretty much on the beach. Bar and restaurants within a few paces. We loved the Ginger restaurant returning there 3 times. Lunch alongside the main pool coud not be faulted. All the staff were brilliant, very well trained and respectful. Facilities perfect and hopefully we will be back next year.